Kalle Hägglund, owner of the publishing house "Hägglunds förlag", published a Swedish edition of Adolf Hitler's Mein Kampf. The German authorities managed to get the Swedish High Court to forbid the publication on the copyright grounds -- but not for long. In 1992, Hägglunds förlag had 10,000 copies of an old translation printed. In 1994, the Free State of Bavaria filed suit against Hägglund for copyright infringement. Due to the gravity of the case, the Swedish prosecutor ordered the confiscation of the remaining 150 copies. On March 7, 1996, the trial was held at the Stockholm municipal court. Three weeks later, on March 28, the verdict was announced: By the court's recognition of Bavaria's claims as valid, Hägglund was found guilty of infringing on Adolf Hitler's copyright. The case was taken to a court of appeal (Svea hovrätt), and on October 13, 1997 this upheld the verdict of the Stockholm municipal court. Hägglund was prohibited under penalty of a fine of 1,000,000 Swedish kroners from continuing to publish Mein Kampf in Sweden; he was however granted leave to take the case before the Swedish supreme court. Finally, on December 21, 1998, the supreme court delivered its ruling: Bavaria did not own the rights to Adolf Hitler's works in Sweden, and thus had no locus standi to bring a copyright infringement lawsuit against Hägglund. 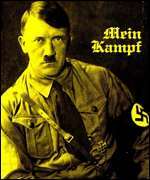 Bavaria's request for the remaining copies to be destroyed was also denied, and the prohibition against Hägglund continuing to publish Mein Kampf under penalty of a fine of 1,000,000 kroners was removed. Still, the supreme court found Hägglund guilty of infringing upon a copyright belonging to somebody, irrespective of who that owner was, and thus upheld the ruling of the court of appeal in this respect. Since 1982, according to Article 59 of the Swedish Copyright Act, a public prosecutor may take criminal action against copyright infringement even when there is no complaint from an injured party, if such an action is called for "in the public interest". This is an interesting twist, and it is as yet unclear what this may mean in other cases of a similar nature. The case of Bavaria vs. Hägglund (up until 1995, before the first trial) is described in detail by Hägglund's defence attorney, Erik Göthe, in his book Den vanliga vägen (only in Swedish). Related materials: For an article on the above, "Mein Kampf banned" see Folket i Bild no 10/1997 [Swedish | English] (this was before the Supreme court judgement in December 1998).